The Magplane vehicles use neodymium-iron boron permanent magnets in the lift system, with the magnets arranged in an "8-block Halbach array" configuration. The four lift pads together weight four metric tones and result in an operating air gap of 10 cm for the 25 tonne vehicle. The vehicle is suspended above a semi-circular metallic trough by virtue of induced currents in the guideway. Both the levitation and side-to-side guidance forces are passively supplied by the induced currents, and require no feedback control to maintain the equilibrium position. The vehicle is free to bank in curves an therefore automatically maintains the coordinated bank angle appropriate to its speed. The speed necessary to induce sufficient current for take-off is 5 m/s. Below that speed the vehicle is suspended by rubber tires. The large operating gap results in a relatively soft resilient suspension eliminating the need for a secondary suspension. The suspension, however, is under damped, requiring active control to supply sufficient damping to maintain passenger comfort. At high speed the control damping is supplied by adjusting aerodynamic control surfaces on the vehicle. At low speeds damping is supplied by magnetic field control. The Magplane propulsion is supplied by a linear synchronous motor. The on-board magnetic fields are supplied by a neodymium-iron boron permanent magnet Halbach array weighing 7 tonnes. An active 3-phase winding at the bottom of the guideway supplies the necessary forward thrust as well as a variable vertical thrust component for damping control. The on-board power necessary for control and communication and for HVAC is supplied by a light weight high performance battery bank. The bank is recharged at the end of each operating shift. The Magplane geometry lends itself to an all magnetically controlled switch requiring no moving parts. The vehicles can be magnetically directed to continue on the straight through path, or to follow a turn-off path into an off-line station. The details of the switch are proprietary. The Magplane concept has been developed over a number of years, having been first proposed by MIT in the early 1970s. A 1/25th scale model was built at that time and operated on a 100 meter track. 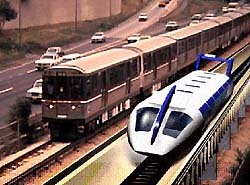 Magplane led one of the four Maglev Concept Definition Studies in the early 1990s. As part of that study a detailed 6-DOF simulation model was built, which demonstrated the efficacy of the resilient suspension and damping control systems to meet the mandated passenger comfort requirements. In the late 1990s the Magplane Linear Synchronous Motor technology was used by the company in a phosphate ore pipeline transport system for a large mining company in Lakeland Florida. At the present time the company is engaged in the design of an urban transit system in Chengdu, China which will utilize Magplane technology. A Magplane manufacturing facility will be built in Chengdu by a recently established Joint Venture Company and will include a 2-km long test facility. The facility will be utilized for safety qualification prior to operation of a 20-km revenue line between the city center and the edge-of-city high tech zone. Magplane intends to capitalize on its simple technology and low tolerance guideway requirements to offer a maglev system that will compete economically with rail systems while at the same time offering operating advantages. The company, together with their business partners, intends to focus on the Asian market.